This light, non-greasy lotion contains quince seed extract, which helps regulate the moisture content of the skin, so it won't dry out. It preserves and improves the elasticity of the skin and leaves it feeling soft and refreshed. This subtly-scented lotion cools and soothes skin. It is easily absorbed and encourages natural regeneration, leaving skin feeling silky and smooth. It balances excessively dry skin on the body and maintains the skin's pH balance, a slightly acidic natural protective layer. This gorgeous lotion regulates the moisture content and maintains the elasticity of the skin. Water/Aqua, Pyrus Cydonia Seed Extract, Alcohol, Prunus Spinosa Fruit Extract, Prunus Spinosa Flower Extract, Arachis Hypogaea (Peanut) Oil, Salvia Officinalis (Sage) Leaf Extract, Olea Europaea (Olive) Fruit Oil, Daucus Carota Sativa (Carrot) Root Extract, Lysolecithin, Fragrance/Parfum*, Citral, Citronellol, Limonene, Geraniol, Linalool, Benzyl Benzoate, Eugenol, Simmondsia Chinensis (Jojoba) Seed Oil, Algin, Xanthan Gum, Lecithin, Silica *purely from essential oils and plant extracts - does not contain synthetic fragrance. Apply when necessary. Most effective when applied over the whole body after a bath or shower. Quince Body Moisturiser can be very helpful in relieving eczema on the body because it is non-greasy and intensively moisturising. It can also be used after shaving (for example, your legs). It has a refreshing, spicy smell and is very cooling for the skin. 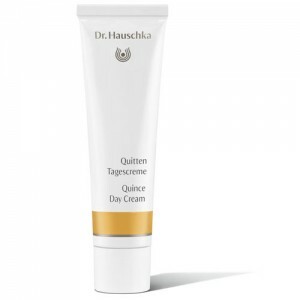 You can mix it with a Dr.Hauschka Body Oil, and use for a nourishing massage. It rehydrates dry skin, and is non-greasy, so you can get dressed straight-away! This moisturiser can also be used after sun exposure, as a cooling and hydrating after-sun lotion. Quince Body Moisturiser is a very refreshing, cool moisturiser for summer use - but why not try Rose Body Moisturiser in the winter for a warming, protecting effect?